The Pilgrimage Church at Zelena Hora was designed by the Czech-Italian architect Jan Blazej Santini Aichl, who delivered a masterpiece out of a combination of gothic and baroque styles. 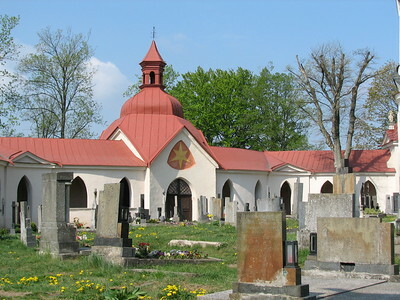 The church was the first major shrine to St. John (Jan) of Nepomuk, a local martyr who had died in 1393. Abbot Vaclav Vejmiuva of the nearby Cistercian Abbey was a great follower of St. John, and had the church constructed in close collaboration with the architect Santini. Already from its beginnings (1721) the church was meant as a place of pilgrimage. The cloister, which encircles the chapel and is based on a ten-point-star groundplan, was completed later (in 1769). 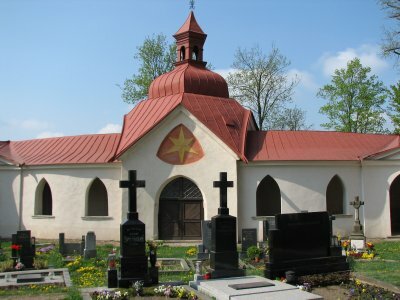 The name of the town is Zdar nad Sazavou, where this church is located in the outskirts on a green hill (Zelena Hora). From the train station, bus number 2 to will take you there. Otherwise, it’s a 3 km walk. The location of the site is very pleasant: at the bottom of the hill there are a castle and a lake. A long flight of stairs has to be climbed to reach the top, where the cloister, the cemetery and the church can be found. The whole complex is full of symbolism. The number 5 returns often, representing the crown with 5 stars that according to the legend has appeared on the site where St. John of Nepomuk died. There are 5 gates to enter the cloister, the church holds 5 chapels and 5 altars. The church also has windows in the form of a bishop’s mitre and of a tongue, the part of St. John’s body that had been miracleously preserved and was taken as proof of his sainthood. The cloister is decorated with 10 very different towers, all very pretty and some with sculptured figures on top. For 50 kroner there are tours to the interior of the church. An English explanation (on paper) is available. Beware that it’s closed from November to March! The church is quite small on the inside. Because of its unusual shape there’s not much space left to hold a congregation. Several original sculptures can be seen. Reconstruction works are being executed on the ceiling. In all, I found this a very atmospheric site that just oozes religious symbolism. It turned out that those people I saw was contractors who were rushing their jobs in order to complete the church restoration before the summer. There was no guard so I just entered the compound with no problem. Inside was a complete mess with restoration materials almost everywhere, the design of five pointed star shape church was really unique and look a bit confusing in design and I was curious for its interior. Unfortunately, the doors were close, they seemed to just repaint the doors and put plastic sheet to cover all wooden parts. I also noticed the recently move gravesite, a thing that I read before that church is in the process to remove all grave to the new one outside the church compound. The layout of ten pointed star cloister was amazingly complex, walking around the cloister was a bit like walking in the labyrinth. 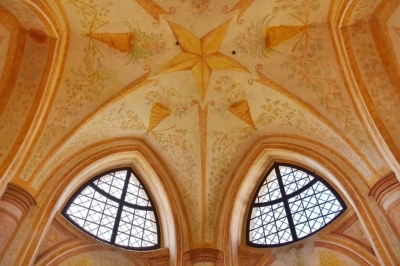 There were some nice chapels and ceiling painting which clearly inspired from the star shape. Even for a casual visitor the star related design and symbols were easy to notice which made me immediately googled the story of St. John of Nepomuk in order to understand the meaning. I spend around thirty minute in the compound, there was nothing much to see actually. Anyway I really appreciate the unique design and the play of symbolism of the church. Judging from the layout and design I don’t think the architect expected many pilgrims, there was no such place that suitable for gathering large people, maybe the outside beautiful green hill is more appropriate for religious practice. 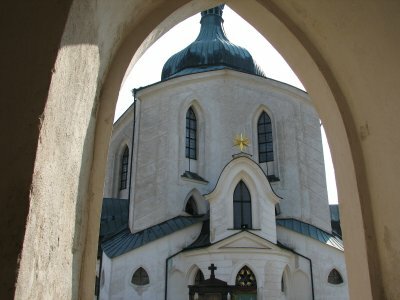 Its outstanding universal value, in my opinion, was quite OK since most of the traditional churches around the world were mostly built on cross rectangular or square shape, so the special design of five and ten pointed star shape of Pilgrimage Church of St. John of Nepomuk is a good example for original idea, a unique site among World Heritage Sites. 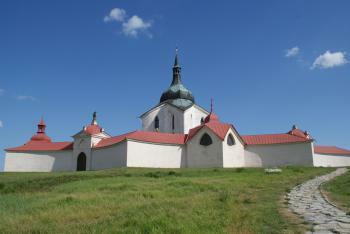 The Pilgrimage Church of St. John of Nepomuk is located on the top of a green hill (Zelena Hora) near the town of Zdar nad Sazavou. The complex consists of the central church with a ground plan in the form of a 5-pointed star and the surrounding cloister in the form of a 10-pointed star. It is no wonder that most of the photos that can be found in the Web show the church from the bird's eye view. But not only the geometry of the ground plan is unusual. Also the architectural style with the combination of Gothic and Baroque elements is exceptional. As mentioned by other reviewers, the symbolism of the number '5' plays a major role and it is fun to look for the '5' everywhere inside and outside. The church itself is rather small and it does not take long time to visit the interior. There is little decoration and ornament in the church, but because of the five-sided geometry there is only little shadow, the interior is bright, and the sun generated nice light effects through the stained glass windows. All in all, this WHS can be visited in less than an hour. That we've spent a fair bit more time there was mainly due to the beautiful weather. The bright blue sky in combination with the white of the walls, the red of the roofs, and the green grass around gave the whole scenery a very special charm. Such circumstances often contribute significantly to the pleasure of a visit. I'm sure, at a cold, rainy day our visit would have been less remarkable. It is a magical place: highly symetrical church surrounded by the cloister with chapels situated on the top of the bare hill. The impresive interior has been reconstructed according the old plans. The ansamble was built in the special czech style - so called gothic baroque. I have been many times to Zelená Hora, a hill situated near Žd’ár nad Sázavou. On the top of it there is erected the pilgrimage church of St. John of Nepomuk, constructed in the begin of 18th century on a star plan, the masterpiece of Jan Blazej Santini Aichel and of his personal Gothicizing Baroque style. It is a central complex and its proportions are based on the number 5. There are two radials and two groups of five radial axis that determine the position of the elements. The church is decorated with stucco, pilaster frames, portals, windows and vaults. The interior is divided in two spaces by a gallery and has five niches with altars. It is in the middle of a cloister (where is a cemetery) that is also constructed on a star plan and has gates and chapels. I was a little bit disappointed by this church because it isn't much artistic and must be restored more well, but its project is of high quality. It is worth to be visited if you are in the region Vysoèina and it however justifies the inscription, because it is Santini's masterpiece and the best expression of the personal style of this great architect; it could be inscribed also with the adjacent Santini's complex of the Cistercian convent with the church, the guest quarters and the cemetery, or even with other Santini's buidings in the Czech Republic. The church here is the work of the architect Jan Santini, who developed his own style mostly based on baroque but with gothic influences. The church is on a hill which can be climbed by the recently renovated stairs. The church is surrounded by an exterior wall which forms an internal cloister containing a grave yard. There are proposals to remove the headstones and return the cloister to its original state. The Church sits proudly in the middle of the ensemble. I found that walking around was a little disorientating as the courtyard is pretty much symmetrical so when I got to a gate it wasn't the one I thought it was. Every aspect of the ensemble is planned to be significant to the story of Jan of Nepomuk who was martyred in Prague for not revelling royal secrets. 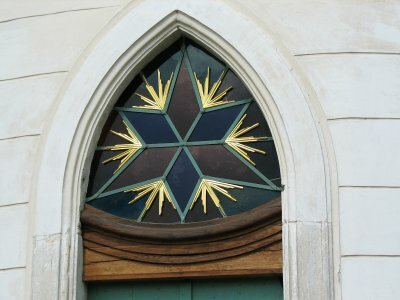 The five pointed star and tongues occur consistently in the design and decoration of the church, this is why ICOMS viewed it as being a form of Gesamtkunstwerk as its architecture is linked to symbolism and other art forms of the baroque period. Inside the church they have a CD to play which gives you a good idea of the significance of the design. The "tour" is available in about 5 or 6 different European languages. The interior is pretty impressive but was being restored when I visited. At the bottom of the hill is a monastery also designed by Santini and its chapel contains an impressive baroque interior which almost verges on Rococo style. The site was quite impressive for its uniformity and architecturally was very interesting. I don't think it is a "must see" though, but it is close to two other sites in South Moravia so if you are in the area it is worth a visit. The church is situated on the outskirts of the town of Zdar nad Sazvou, it is not the nicest of towns but has direct train links to Prague (two and half hours) and Brno (one and a half hour), from the station it is about 3km to the site there are local busses that run there. The church by the interesting architect with the curious Czech-Italian-German name Jan Blazej Santini-Aichel has been sufficiently described here. The number 5 appears all over, and it´s a nice enough building in a beautiful location. Zdar nad Sazavou is an industrial town that doesn´t hold any other attractions (but some street names like Revolution and First of May are reminders of the not-so-distant past - there´s also a part of the town called Stalingrad ...) It´s easy to reach from Brno, as it´s located directly on the Brno-Prague train line, and an integral part of the Southern Moravian WHS hotspot. The interior is still being renovated, but there´s still enough to see for a pleasant outing.